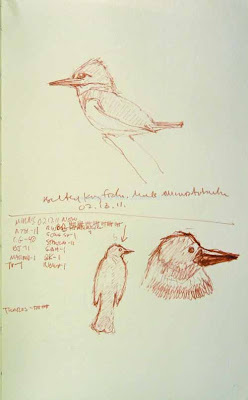 It's hard to believe that it was only 10-14 days ago that I did field sketches at Morris Arboretum of Belted Kingfishers, Painted Turtles and Snow. Since then I've done one wash drawing based on this scene as well as one more fully developed watercolor. Today I finished a linocut on the same theme. This print is 9x12 inches for the entire print, 6x8 inches for just the image. It's printed in a dark slate gray, though it may look black in the photos, on cream Rives Lightweight paper. It's an edition of 12. 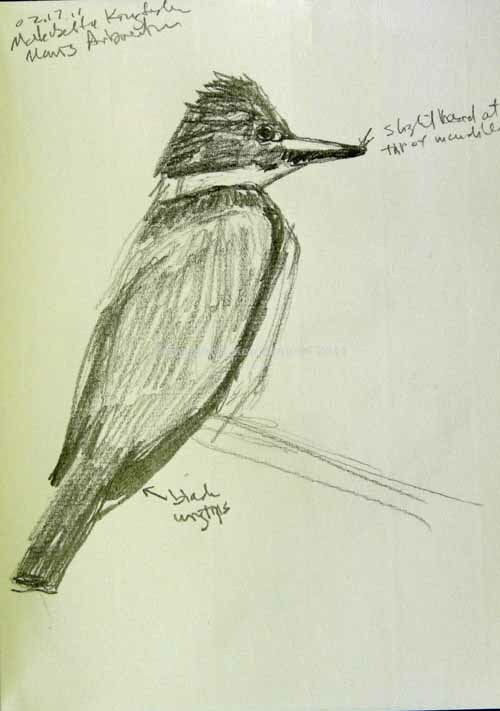 I've titled this post as I have because it all came about because of my field sketches. Often when I'm out people will look at them, see that they're not fully developed, and I suspect sort of write them off as scribbles. But for the artists I admire they are the richest sort of material you can find. Photos don't hold a candle, not even a cheap wooden match to them. I've written about this many times so there's no point in repeating myself. But I did think the work I've done based on those small sketches is a good illustration of my point. I did do something different with this print. I used transfer paper to trace the outline of the last watercolor onto the linoleum block. In the past I've used my own primitive makeshift methods that give me a rough skeleton to improvise on. The one problem is that sometimes the lines don't have th sureness of the original drawing, sketch or watercolor. I'd prefer to just carve into the block while looking at my original work. 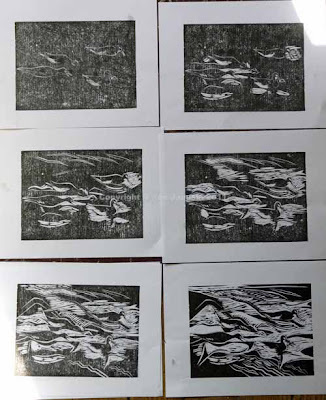 But relief prints print in reverse so if I copy what I see I'll actually get a print with everything in reverse. Thus the need for some sort of transfer method. So finally I broke down and bought some transfer paper. Only problem: the print came out in reverse. To make a long story short this print is actually a reverse of the last watercolor. Normally I wouldn't want to do that because often such reversals just look wrong. But in this case I think it did not harm it. And it was too late to do anything anyway. I also was tempted to do this as a reduction print, using more than one color. But I finally decided to keep it simple. But there still may be a multi-color reduction print on the horizon. 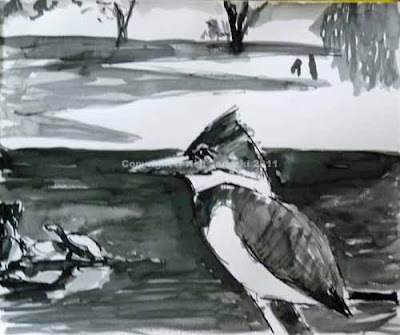 Lastly I'm very happy having captured this unusual scene: snow, basking turtles and a Belted Kingfisher. That's the type of thing I aspire to. It's been awhile since I've done anything other than quick works and sketches. That's fine. I feel like I need to move back and forth between the easy and the hard, that which puts a lot of pressure on me and that which puts little. Of course that pressure is primarly the pressure of failure. But you never really improve without risking failure. There's only the thrill of success when you realize that you're taking a chance and risking something. But this does take a toll, so I for one have never seen any need to put constant pressure on myself. All of which is a long roundabout way of saying I wanted to try something more ambitious with my sketches of the Belted Kingfisher, Painted Turtles and Snow. 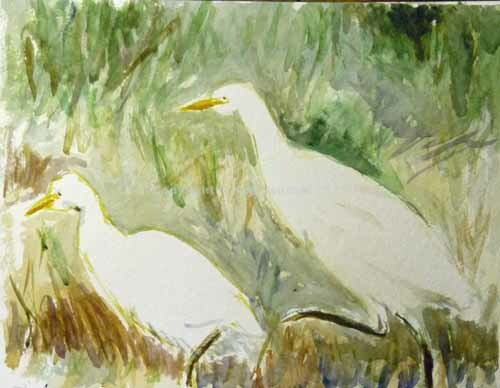 The accompanying photos show two versions of a new watercolor. It's a slightly different design than the last wash study. One of the things I'm finally starting to get comfortable with in representational work is modifying what I actually saw. For years I couldn't do this. I only felt comfortable drawing or painting exactly what I saw, whether in real life or from a photo I took. But happily that has changed. And there is something thrilling about creating your own world, almost like writing a novel. The first version at top is the most recent version. I changed it from the second photo because I was afraid the kingfisher got lost in all the surrounding blue. So I made some of the water a bit more green/brown. And that was probably accurate as well. I didn't take any photos of the water so I can't say for sure. I'm not sure if this is done. Pretty close if not actually done. You can only work a watercolor so far without ruining it. 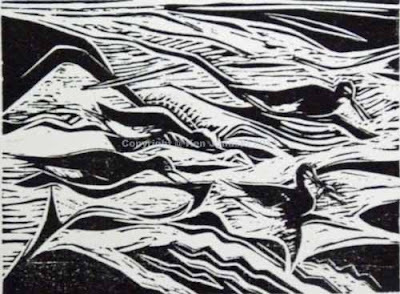 And I still think I'll do a linocut of this same subject. 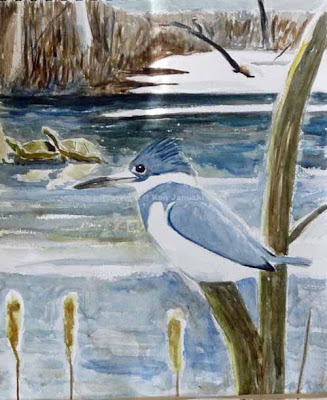 Even when I was out doing the recent field sketches of Belted Kingfisher and Painted Turtles in nearly 70 degree temps, there was snow all around me. Yesterday was the second day of the Great Backyard Bird Count and yet it was so windy that there were almost no birds at our backyard feeder and only one solitary Ring-billed Gull in my 20 minute walk around the Roxborough Reservoir. So spring was here just briefly. Today it's back to being cold and snow is in the forecast over the next week. Still I did think about capturing the odd juxtaposition of turtles basking on logs in the sun while the surrounding ground was covered in snow. And I also wanted to get the kingfisher in. 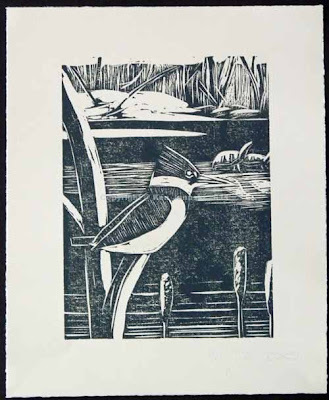 He was in the same pond, often perched on snags, but never close enough to be in the same view. I did something similar last year with a Great Blue Heron and Belted Kingfisher also seen in the snow for the GBBC. The birds were never so close together that they'd appear in a photo if I were to take it of the actual scene, at least not large enough to be identified. But artistically I wanted to put them in the same scene, to take some artistic liberties. 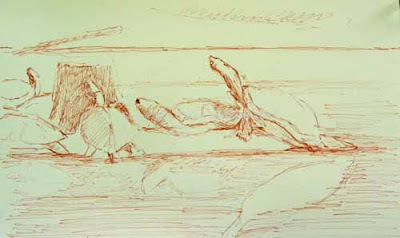 I'd recently seen some wash drawings that I'd like. Some were by John Constable, others by Claude Lorrain. Both reminded me of how much I enjoyed wash drawings. So when I looked for a way to experiment with designs for a finished work, maybe watercolor maybe linocut, I thought about doing a wash drawing. But how to do the ink drawing? For years I used to do large nudes using a bamboo reed pen. I see you can still buy a set of three for under $4. They are a bit messy because there's no reservoir to hold the ink. You just have what sticks to the end of the pen when you put it in the ink. But they do make a very quick and fluid line. That's what I always loved about them. In any case I got out one I hadn't used in 30 years or so and used it with some equally old India ink. Then after that I used watercolor brush to add wash and straight India ink. There's room for improvement in this. But it did what I wanted, allow me to test out a quick design that combined bird, turtles and snow. I think it stands alone. But it also may be just one step on the way to something more developed. I do love capturing these odd natural moments. We birded for the Great Backyard Bird Count last year in two feet of snow or more. This year's GBBC starts tomorrow. Instead of two feet of snow though we had temperatures in the mid-60s today. A welcome change but one that can't, and shouldn't, last. Still I took advantage of it to do some field sketching at Morris Arboretum. 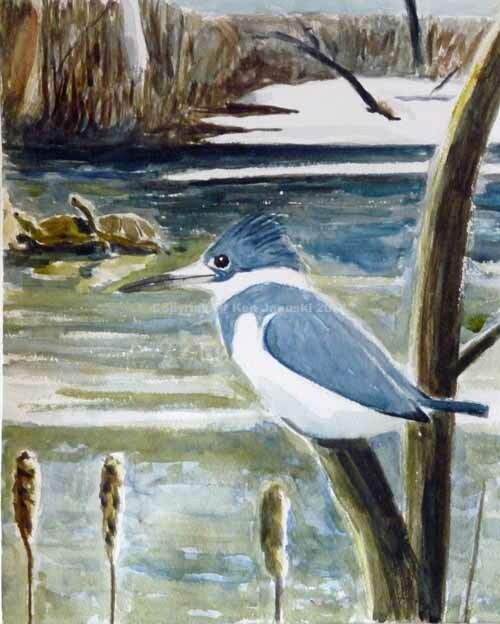 Like another trip there last Sunday a male Belted Kingfisher was evident. 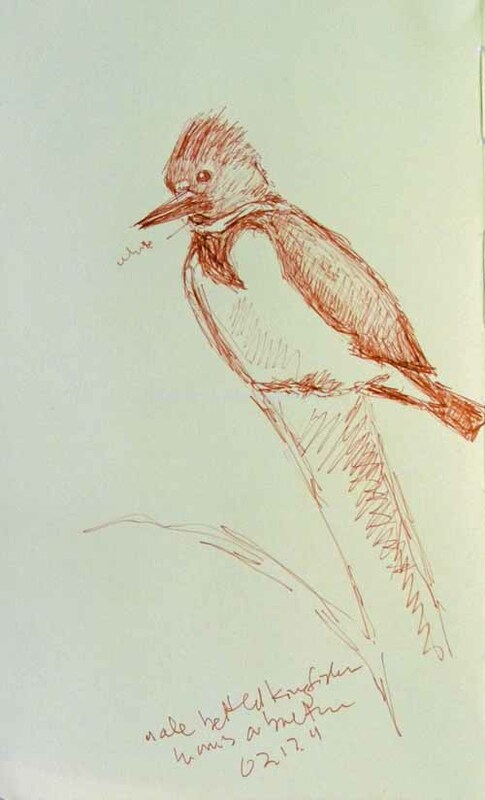 And he seemed to stay in one place so that I could sketch him through the scope. Normally he just doesn't stay in the same place or pose for long. I wonder if it's possible that there is less food available for him and so he just goes to a few choice spots overlooking the open water waiting to see fish movement. That's just a wild guess. In any case it's been a pleasure to have some chance to draw him. All of the drawings but one above are done with Pitt Artists Pens. The other Kingfisher is done with a 4B pencil. These are very different media. Normally I like the greater expressiveness, due to fluctuating line weight, that a soft pencil offers. But I've never found myself happy with them when field sketching. Maybe the lines are too loose and inexact. I'm not sure. But for some reason I favor the more inflexible pen line. Out of curiosity today though I did one in pencil. As you may notice one 'bad' side of using a pen is that you can't erase. But that's fine. I know I'll have to live with what I put down so I don't worry it to death. In the case of the massive bill on the Red-winged Blackbird above though you sometimes have to live with some obvious mistakes. Last Monday I heard my first singing Song Sparrow. Today at Morris I heard more as well as many singing male Red-winged Blackbirds, another first for the season. Along with them I believe the first basking turtles I've seen. Often I tell myself I ought to sketch them. Today was such a beautiful day and I had some free time so I also did a sketch of them. It could use more work. 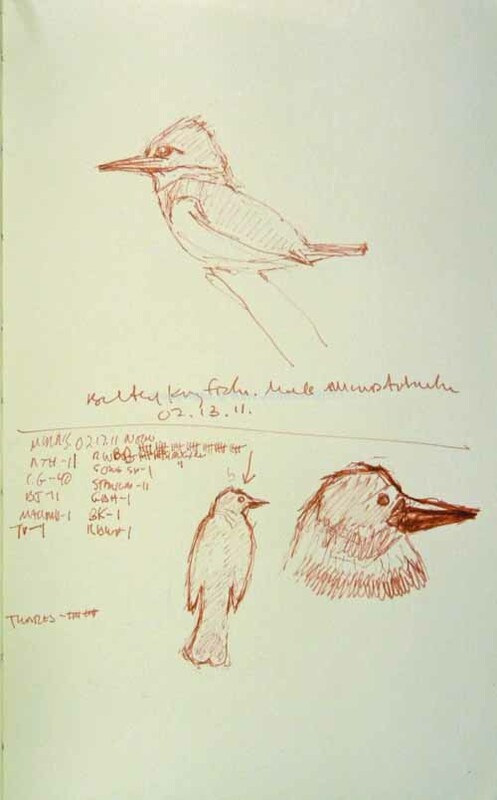 But often live field sketches are like that. You capture what is there and then use that as the basis of something more developed in the studio. I'm sure we haven't seen the last of these kingfishers or turtles. Over the last couple of days I've seen a life bird(Redhead)less than a mile from home and also heard the first singing bird of spring, a Song Sparrow singing loud as could be. I only heard him because I was driving with the car windows down during a day of unseasonably warm weather. But those stories will 'have to wait. My wife is a huge cat lover and we have a number of them. But cats are trouble for an artist. They are so 'cute' and so even attempting to draw or paint them always takes on the huge burden of 'cuteness.' So I've always avoided them, even our own exceptionally cute cats. But we've always had a favorite cat. He died a number of years ago. For Valentine's Day I decided to try painting a portrait of him, based on some photos. 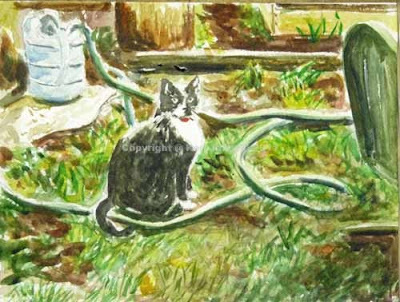 I think it does look quite a bit like him and his posture, king of the garden. For many years the garden seemed empty without him. But this brings back those sunny summers. For that reason it seemed like the perfect Valentine's Day present. It's hard to believe that spring is showing some signs of appearing once again. I wish I could say that I've seen these signs personally. But I haven't. It's just what I've read. The PA Rare Bird List has included reports of the first singing Tufted Titmice and Song Sparrows. In Delaware I believe I read that a Black-crowned Night Heron had returned. Soon, especially if there's snow, we'll see members of the blackbird family in our backyard, at least for a moment or two. It's about time to see some Common Grackles along with our unwanted guests the Brown-headed Cowbird. Today I wanted to try a 'flash' painting, an exercise where you do a painting without any pencil sketching in 15 minutes. I decided to use some photos of the first ever Cattle Egrets that we saw in Cape May, NJ last November. The first attempt took 30 minutes so I couldn't really count it. The next one took only 15 but when it was done I felt it was incomplete. So I later went back into it. The results are at top. I probably spent a total of 30-45 minutes on it. Paintings like this aren't finished. They're just exercises that sometimes also look like paintings. I do like the sense of life that they often have, even if there's little sense of finish. Cattle Egrets do in fact seem to march, or strut, often leaning backwards a slight bit. They march steadily on, just as I hope spring will continue to do. This is one of the prints from a finished edition of 12 of the Greater Yellowlegs feeding. I made extremely small changes to it from the last version that I posted. There is much detail lacking in the plumage and I was sorely tempted to put it in. But I was afraid that if I did some of the stark contrast would disappear. The print might be more naturalistically accurate but artistically diminished. After a few days of thinking about it I decided to leave it as is. I'd like to experiment with bolder prints and I think that this is the only way to get there. Above I'm showing the first 6 proofs of this print. They show the progress as I went along. 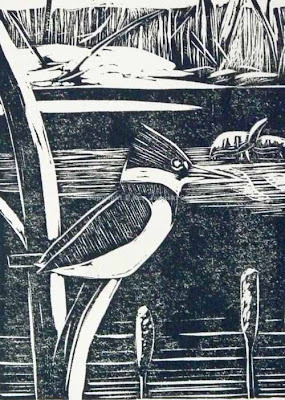 Many artists from what I can tell have a good idea as to how their finished print will look and just start carving and keep going. But I'm not like that at all. Who knows if I'll ever work that way. Instead I have the vaguest idea of what I want and then improvise as I go along, reacting to each proof and then making changes based on what I see. So I thought some readers might be interested in seeing this. 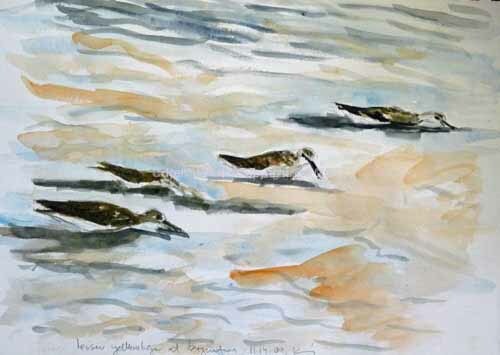 As you can see at top left I start off with only the vaguest sketch of the Greater Yellowlegs. I don't want deep cuts to begin with because I first want to see what they look like. If I'm happy with them I'll eventually make deeper, bolder cuts. If not, well I'll try my best to cover them up! The finished edition by the way is for sale at my Printsy site. Complete images are 9x11 inches, and the image along 6x8 inches. This is an edition of 12 on Rives Lightweight paper, using Gamblin oil-based inks. I think I mentioned in last few posts that I like going back and forth between the more careful, detailed, restrained style of some recent watercolors and the greater boldness, simplification and greater abstraction in my linocuts. Since I've done a number of such watercolors over last few weeks it seemed time to get back to linos. But what subject? 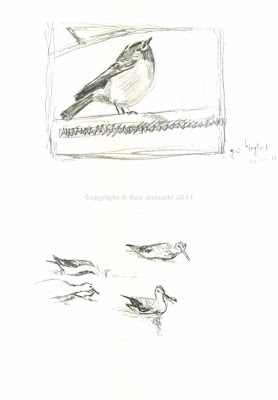 I did a number of sketches as tests and finally settled on four feeding Greater Yellowlegs that I saw a couple of years ago. I was tempted to do the Golden-crowned Kinglet on same sheet of paper but finally opted for the yellowlegs. I'm also showing a watercolor I did of them from a photo from a year or two ago. This watercolor is much different from my recent ones but that's because at that time I was trying to develop some freedom with watercolor and not use it tentatively as just a medium quietly at the service of the underlying drawing. At that time I skipped drawings and tried to do it all with a brush. It was a very useful learning experience, and one that I'm sure I'll go back to. For now though I just wanted to use the basic scene as the basis for a lino. One difference is that I substituted one feeding yellowlegs with another one that had actually caught a small fish. And pattern? Why title the blog 'Sensing a Pattern?' 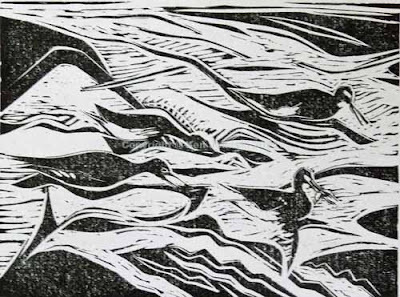 Well I realized back when doing the Laughing Gulls linocut that both woodblock prints and linoleum block prints really lent themselves to lines, and to patterns formed of lines. 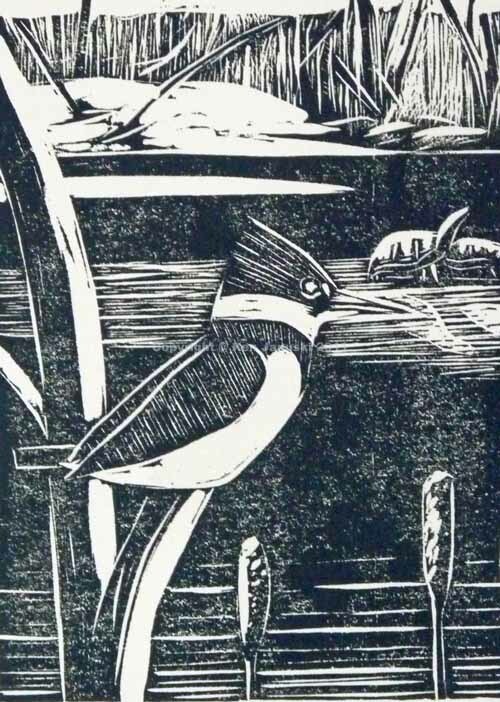 Though I've tried to give some sense of modeling(the creation of a sense of roundness) to my linocuts this isn't something that these woodcut or linocut excel at. At best you can use a type of hatching to suggest roundness. But you can't use the actual modeling, the gradation of color to suggest modeling, that comes so easily to painting. So modelling is difficult and somewhat counter-intuitive in these media. In this print I decided to greatly lessen modeling and instead concentrate on a flatter design with more sense of pattern. Water lends itself to pattern so this also seemed a good reason to concentrate on pattern. Just one problem: I can't really see patterns before they're there in front of me. Some people might be able to visualize how to develop a pattern in a print before they start carving. 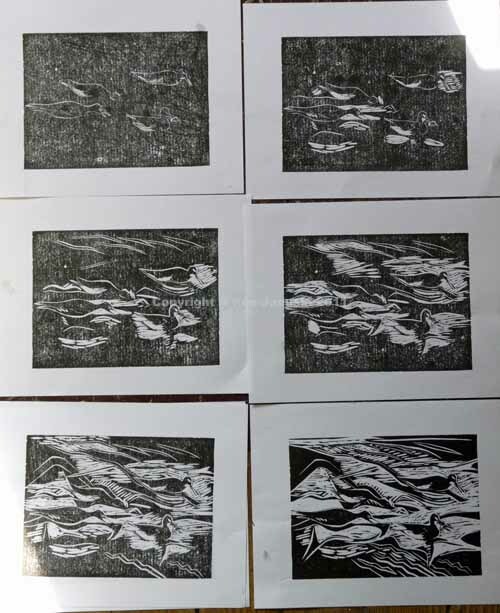 But I can't really tell what type of patterns I might want to use until something in the first proofing of the print suggests itself to me, just as some sculptures tend to see a pattern in a piece of wood or stone. I've developed a pretty strong sense of pattern here, perhaps so much that it overshadows the yellowlegs. I don't think so but I think it's time to take a break and let this sit. As with watercolor it's too easy to cover everything with color or cut away all the linoleum. Sometimes it's best just to stop and take a break. This is 6x8 inches on printer paper. Once I'm finally happy with it I'll print an edition on good paper.